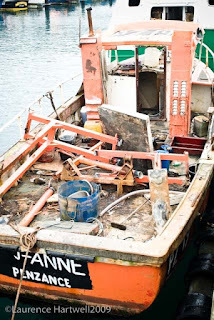 The life of Newlyn trawlerman Mike Mahon - Part III. A one man floating protest Grimmy talking to the End of the Line filmmaker. Following his Canadian flag success, Grimmy set his sights on bigger things and, like his pal, skipper Mick Faulkner from Newlyn, saw Nigel Farage, the then leader of UKIP, as someone who might one day take Britain out of the EU. Though privately they must have thought that he had little chance of actually doing so, they fought with all their political strength to help UKIP achieve what it did. 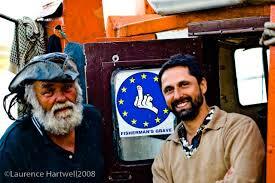 Grimmy before the start of his 2004 voyage from Newlyn to the House of Commons aboard his 29ft trawler, J-Anne, which was decked with banners to protest against the dumping of fish. Eventually, with his promotional banners and handouts ‘aboard’ his scooter, Grimmy toured his potential constituency as a UKIP parliamentary candidate in the 2005 general election. He didn’t succeed, but only just lost his deposit. It may sound impossible, but the prospect of a Newlyn fisherman becoming an MP was of serious concern to his opponents. A growing percentage of the public thought Grimmy was the sort of person they wanted to see attack the pro-EU sector of the Tory, Labour and Liberal Democrat parties. Grimmy said: “Quite a while before I joined UKIP, both Mick Faulkner and I supported the Referendum Party. That was the first party I ever officially joined. Mick stood as its parliamentary candidate in the 1997 general election. I decided to work as his press agent. “Even before the Referendum Party was formed, Mick Faulkner, myself, and many more people in Cornwall wanted some way to help get the UK out of the EU. “One night, I watched the entrepreneur James ‘Jimmy’ Goldsmith being interviewed on David Frost’s programme on ITV, saying that he would put up £20m to set up a party to fight for a referendum. I listened to him, and I got converted. One of several visits to Newlyn by Nigel Farage, then leader of UKIP. Grimmy and Mick Faulkner at first thought that Nigel Farage had little chance of getting a referendum, but fought with all their political strength to help UKIP. “At one of the party conferences, I spoke to Jimmy Goldsmith and suggested that the party should do a flag campaign: get around 600 Referendum Party flags made, supply each boat in a couple of big ports with a flag, arrange the day, get each boat to fly the flag, and make sure the press was there. “I thought that many thousands of flags might eventually be needed, because people would love the idea. Jimmy Goldsmith liked the idea, but his underlings didn’t think it had enough power, so it never went ahead. “I couldn’t convince them, but I did convince Jimmy Goldsmith to start his election campaign in Newlyn. It was low water, and he stood on the quay doing his speech; all the press was around, with the J-Anne below, with a big Referendum Party flag attached to its landing derrick. We went to the Mission for a cup of tea, and he just wrote a cheque for £2,000 and passed it to the then Mission superintendent, Len Scott. Sadly, Jimmy Goldsmith died not long afterwards, and the Referendum Party disbanded. “And with the collapse of the Referendum Party, UKIP – established in London by the historian Alan Sked in 1991 – gained in strength. I was useful to them for talking to the press; I was a rufty-tufty fisherman who wasn’t scared of a microphone, and I wanted to be part of UKIP. 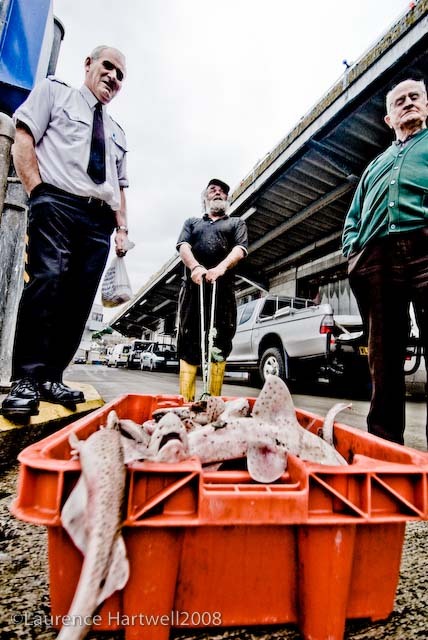 “Yes, over the years, by not dumping fish, but bringing it back to port and giving it away, to pensioners and/or the Mission, I did wind up MAFF (now MMO). Generally, I would toe the line and dump fish. But it didn’t take long for me to again stop dumping fish and face up to MAFF, and this went on and on, until I finally decided to never again dump any more fish – haddock, cod, anything. Dumping fish was, and remains, an evil act – and so I sold the J-Anne and retired. Dumping cod for the press. One of skipper Mick Faulkner’s boats, the Sally Pamela, became a stage for publicising the senseless dumping of fish. “Over all those years of making my protests, I often felt sorry for the fishery officers, because I used to get up to all sorts of pranks, and they knew what I was doing – well, they did in the end! 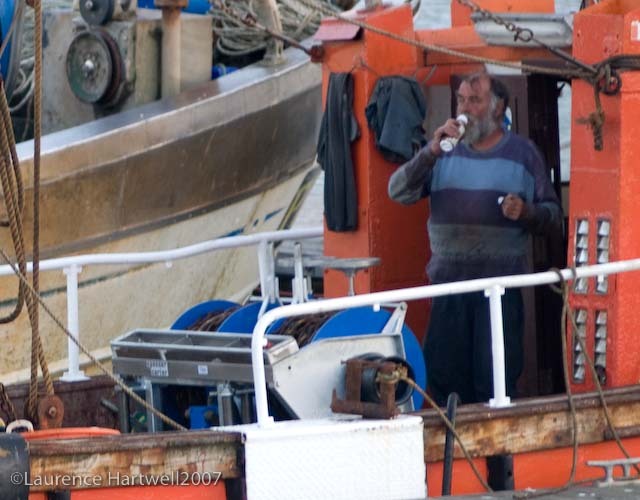 “I always made sure I left Newlyn while it was still dark, but in my logbook I wrote that I had left 24 hours before. If someone from MAFF claimed I had left at 4am on a particular day, it was dark, and if it ever got to court, that was poor evidence – and they knew that, so they were on rocky ground to start with. “I always had a chart of South Wales in the wheelhouse, with tows nicely drawn out, and I steamed to South Wales every trip, didn’t I? “I might have done, but the fishery boats couldn’t prove whether I had or had not been fishing off South Wales. It became a joke, and when I was boarded, they often asked if I had again been on my holidays to Wales! They never once had sufficient evidence. “While the older fishery officers back at the MAFF offices, and the older officers on the patrol boats, had sympathy with my protests, few of the young ones did. They would be on their first job after university, and always said that if British fishermen didn’t break the rules, they wouldn’t be in the trouble that they were in. I wonder if any of those kids ever grew up? Skipper Mick Faulkner (right) stood as a candidate for the Referendum Party, with Grimmy acting as his press secretary. “To my mind, anyone who lands fish instead of throwing it back dead is not a criminal but a hero. While so many people in the world are starving, the people who should be taken to court and locked up are the ministers who watched all of this happening – fish being dumped while children in the Third World die of starvation. “I have watched parliamentary debates by fisheries committees, and listened to the MPs’ opinions, and with idiots like many of the MPs we have, I wonder how Britain still has a fishing industry left at all. And when one of those MPs becomes a minister and comes to Newlyn, any time a fisherman asks them a straightforward question, they never get a straightforward answer. “First an MP, then a minister, and then they become the puppets of DEFRA – and then they do anything that DEFRA instructs them to do. “Every day that goes by, just to see that the UK is sticking to the Commission’s rules, DEFRA civil servants push paper fish around their desks. Those paper fish then go backwards and forwards to Brussels. Then, at the end of the year, DEFRA gets back to the British government, patting itself on the back, saying, ‘Haven’t we done well?’ They are idiots. “All the way back to port, I would spend the time filleting fish that should have been dumped. One chap became a regular at collecting the free fish fillets – though they weren’t free to him, because he spent a lot of time and expenses travelling around giving that fish away, but collecting donations for the lifeboat. In the end, he had so much success at raising money that he kept a stock of fillets, and was effectively topping up three freezers of black fish! “I never took one penny for any of that fish, but whatever charity gave me a collection box, I would wave it. One week it was the RNLI, the next it was the Mission, and so on. 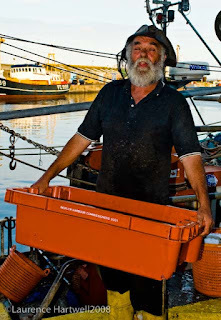 Grimmy with a box of haddock destined for the Mission. “Without knowing it was wrong, the Mission began to accept my free fish. Nor did I know it was wrong to give free fish to the Mission. At that time, each Friday, the Newlyn Mission served fish and chips to fishermen and pensioners, so anybody who went to the Mission café on a Friday could buy fish and chips at a reasonable price. My fresher fish gave a better taste, and in the end, half of Newlyn was going to the Mission on Friday lunchtime. “It came to the notice of the MMO where that fish was coming from. The MMO had already given me a warning, and to press it home, it decided to prosecute the Mission. The first call on Grimmy’s protest voyage to London was Falmouth, where a considerable number of UKIP supporters gathered. “The MMO went with its papers to warn the superintendent, but stupidly, it decided to do so on a Friday, the popular fish and chips day! The Mission superintendent was frightened about the consequences, and later that day told me he could no longer take free fish. So the MMO went back to the office to prepare to do battle with the Mission. “By the Monday, the MMO had realised its stupidity and backed off – but I already had the press gunning for the MMO. Television reporters and newspapers were waiting outside the MMO office to find a fishery officer to interview. All of that day, there wasn’t a fishery officer in sight. “To this day, I still wish the MMO had pounced – can you imagine the television news that night, and the newspaper front pages the next day? But the MMO never did anything. I continued to give free fish to the public, and when I stopped, other skippers did the same – but the MMO kept its distance. 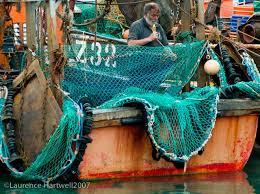 “As far as protesting in the fishing industry is concerned, it has to be done at the right time and in the right place. The end of another day for Grimmy. “At Newlyn, one day in 1988, we decided to protest against a cod ban. 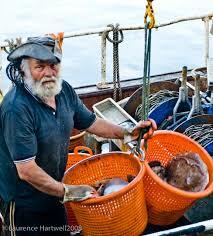 Ready for the following day’s market, each skipper landed just one cod in a box. It was good to watch the MMO men shake their heads, wondering what to do. I had the press standing by, and the MMO knew that. “The MMO district inspector was furious, and for hours was being chased by reporters and photographers. It was great. We were never officially cautioned by the MMO. “Although that protest was successful, I would rather have got 800kg of cod, taken the fish to London, and dumped it in front of Whitehall. Imagine the impact that would have had. It would have been a great way of doing what we are still forced to do, dump dead fish – but instead of dumping it on our doorsteps out at sea, dump it on their doorstep in London. It could still be done, and you might have plenty of chances to practise, because the government will waver in its talks with the EU. “Dump a lorryload of fish in the centre of Manchester, for example, and immediately the people in Manchester will understand what the CFP means. It would be all over local and countrywide media. And when they stop you dumping the fish, still take the fish to such towns, but instead, give it away to pensioners or people on benefits. “What will DEFRA do then? Grab those plastic bags from the pensioners? Even the police would not be minded to get involved with anything like that – most of them would, in truth, like to take part. 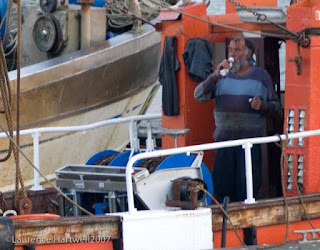 For a trawlerman work doesn't stop when you get back from sea - there's always mending to be done! “As far as past protests in Cornwall go, perhaps we could have done a lot more – but I truly hope that there are still fishermen out there who would fight, and fight hard, were we not to get our waters back. The end of an era - with his boat scrapped, Grimmy retires.